I learned that memory cell at address 0xFCAB holds status of “CAPS” key and memory cell at address 0xFCAC holds status of “РУС” key. That was just enough motivation to write the game. This is a game for two human players. It is somewhat like tug-of-war. Left player hits “CAPS” key and marker moves left. 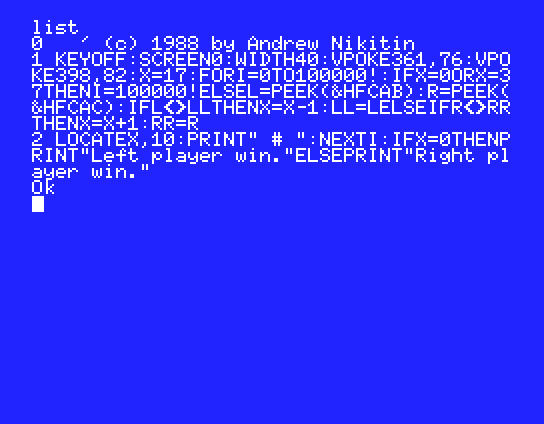 Right player hits “РУС” key (could be “CODE” or “KANA” on your MSX) and marker moves right. Whoever gets marker to his side first, wins. You could argue that I could have written this game in 0 lines of code: just place the cursor in the middle and let left player peck on left arrow and right player on right arrow and see who gets cursor to his side first. However there is a difference. For one, left and right arrows are too close and players would interfere too much with each other. Also, in MSXs I had access to “CAPS” and “РУС” keys had different mechanical properties then the rest of the keyboard and they are not placed in keyboard queue buffer.